In order for school bus drivers to safely load and unload students, they must recognize that there is an area around a stopped school bus that is very dangerous. This is the area near the bus where the bus driver might not see students or where cars might be moving when student riders are getting on and off the school bus. 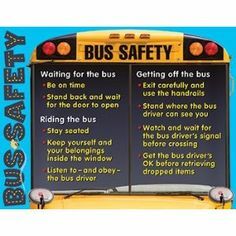 Bus drivers must ensure proper execution of procedures any time students are loading or unloading. Additionally, it is essential that bus drivers use both direct vision and properly adjusted mirrors to see students in the DANGER ZONE. The DANGER ZONE is: The TWELVE FOOT area that surrounds a stopped school bus. Especially the most dangerous areas which are around the left and right front tires, the front door and the right rear tires where it is difficult for the bus driver to see students with their direct vision. These areas are where the school bus poses a great threat to students riders. Additionally, students are at risk to passing motorists on both the left and right sides of the stopped school bus. Stay away from the dangerous areas where it is difficult for the bus driver to see them with their direct vision. Make sure they are always able to see the driver when outside the school bus. NEVER return to the bus for something left behind or dropped without getting the bus driver’s attention. Leave any object and move to a point, out of the Danger Zone. Then get the driver’s attention by putting hands and arms above their head and waving. Wait for the driver to see them and give instructions before returning to the bus or before picking up anything dropped near the bus. If they do not get the driver’s attention, they should not attempt to retrieve the item. Be aware of the danger of passing cars that do not stop like they should. The danger may be from cars passing from the rear on the left side of the bus. Or from cars passing from all directions on both the left and right side of the bus. Our Shop and Office Staff Members are on duty from 5:00 AM to 5:00 PM, well before students are picked up in the morning and after all students return home in the evening. We also have mechanics on call after hours. We at Dawson County Transportation Look forward to Makeing this 2018-19 school year a Happy And Safe one.